Storytelling is an essential tool for expressing our beliefs, culture, and creativity. We spend our lives collecting and sharing stories. Whether we’re recounting a childhood memory or teaching others about a historical event, stories help us make sense of, and connect to, the world around us. Visual art and storytelling are closely associated. When we view a work of art with narrative potential, we are naturally inclined to interpret it. To understand an object, we think about what we see as well as what the object and its artist are communicating. Questions like “Who are the figures?” or “What is happening in this scene?” prompt us to construct stories to explain the object. With their stories, we might see artists sustaining, subverting, or expanding on traditions they’ve inherited. The proliferation of narrative content in Greek art, particularly vase-painting, began at the turn of the sixth century B.C. [i] Without any text to explain what’s happening in these vases, our familiarity with the actions or attributes of the figures depicted is crucial in identifying the characters, and through them, the story in which they are involved. The 6th-century B.C. 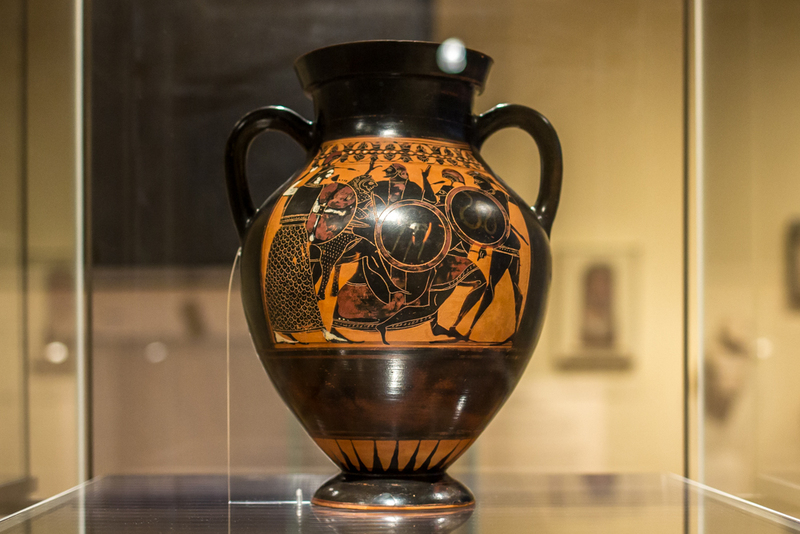 black-figured storage jar, or amphora, depicts a mythological battle scene. The lion skin worn by one of the figures tells us that the figure is Herakles and refers to the circumstances of its acquisition, the Twelve Labors. With his foot mid-air, Herakles steps forward to charge at his opponents. Athena, armed with her helmet and spear, stands either in front of Herakles on one side of the vase and behind him on the reverse side of the vase. Two of the three hoplites hasten away but look back, indicating their retreat mode and an impending victory for Herakles and Athena. The alliance between Herakles and Athena alludes to Athena’s role as a divine comrade to great heroes in mythology and art. The nature of narrative art like this amphora requires the viewer to access prior knowledge of visual cues and iconography to read the content. As the viewer begins to study the meaningful features, the story unfolds. Whereas the Greek vase was a propagation of an established narrative, Some Living American Women Artists/ Last Supper is a challenge to powerful narratives in the history of art and religion that have excluded women. The artist, Mary Beth Edelson, takes a reproduction of Leonardo da Vinci’s Last Supper and replaces the heads of Jesus and his disciples with photographs of women artists. “The most negative aspect of organized religion, for me,” says Edelson, “was the positioning of power and authority in the hands of a male hierarchy that intentionally excluded women from access to these positions…[The work] gave me a double pleasure of presenting the names and faces of the many women artists who were seldom seen in the art world of 1972 as ‘the grand subject’—while spoofing male exclusivity in the patriarchy.”[ii] The resulting work showcases women in a male context and connects art with religion. The poster not only commemorates women artists but also highlights the struggles women have confronted in their professions. The act of women taking the place of men in an important historical painting overturns gender constructs. By appropriating the message of the male-dominated Last Supper painting, Edelson effectively asserts the voices of women and their place at the table. The narrative content of objects is not necessarily fixed. Objects can convey different and new stories depending on their environment, use, and audience. Masks, for example, are not simply static images; they are imbued with social relationships and act as vehicles for powerful storytelling. Wooden masks were one of the many elements used in okumkpa, a masquerade tradition of the Afikpo of southeastern Nigeria. [iii] The play essentially functions as a community theater, touching on issues exclusively known to the people of the village. Although the play primarily ridicules and satirizes community members and relevant events, it offers moral commentary on how residents have behaved, establishing a standard for how they should behave. The masked players embody mma, a type of spirit intended to protect the players and provide them the freedom to perform without restraint. The senior leader of the performance would wear the Nnada Okumkpa, direct the skit, and narrate the action. When the masks became animated, they interacted with the viewer and situated him as a participant in a performance. While admiring the staging of the masquerade performance on the fourth floor gallery, I overheard a visitor commenting to her friend, “I’m waiting for one of them to start moving.” Though still and silent, the mask in the museum is a suggestive remnant of the movement, sound, and drama of performance. Visual storytelling involves an intimate interaction between an object and its audience. When we choose to become immersed in the objects, they bring out very personal responses. We may laugh, cry, or even critique the story we believe we see in the objects. Our engagement with art ultimately keeps the stories alive. I hope you will find a good story during your next visit to SAM! [i] Mertens, Joan R. How to Read Greek Vases. New York: The Metropolitan Museum of Art, 2010. [ii] “Mary Beth Edelson.” Avalanche. 1973. [iii] Ottenberg, Simon. Masked Rituals of Afikpo: The Context of an African Art. Seattle: The University of Washington Press, 1975. Images: Manuscripts and Archives Division, The New York Public Library. 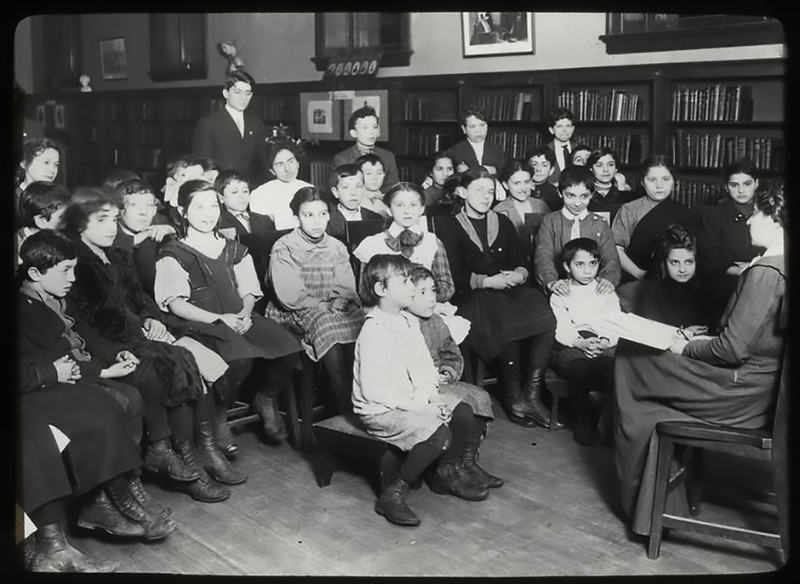 “Work with schools : a librarian’s assistant telling a story to a group of Russian children in their native language, ca. 1910s.” New York Public Library Digital Collections. Accessed January 8, 2016. http://digitalcollections.nypl.org/items/510d47da-e5f7-a3d9-e040-e00a18064a99. Black-Figured Amphora with Herakles and Athena, Greek, 6th C., B.C. Gift of Norma and Amelia Davis, 82.83, Photo:Natali Wiseman. 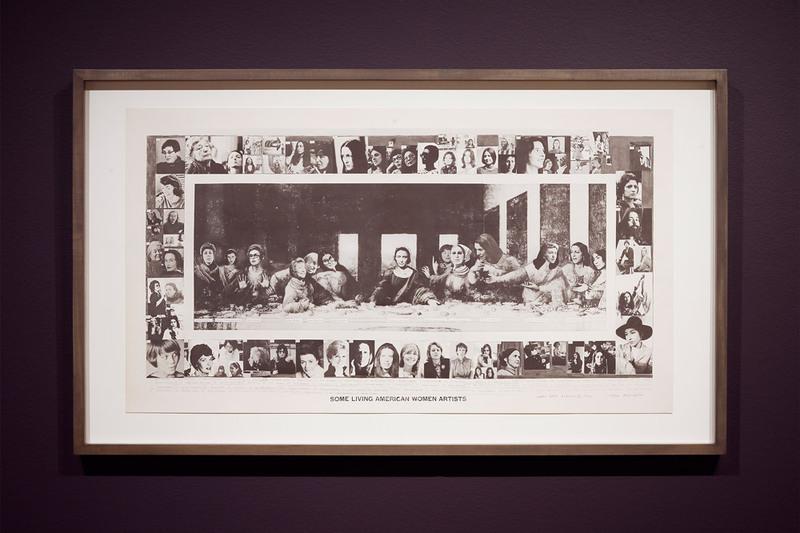 Some Living American Women Artists/Last Supper, Mary Beth Edelson, 1971. Purchased from artist by Seattle Art Museum, 98.14, Photo: Mark Woods. 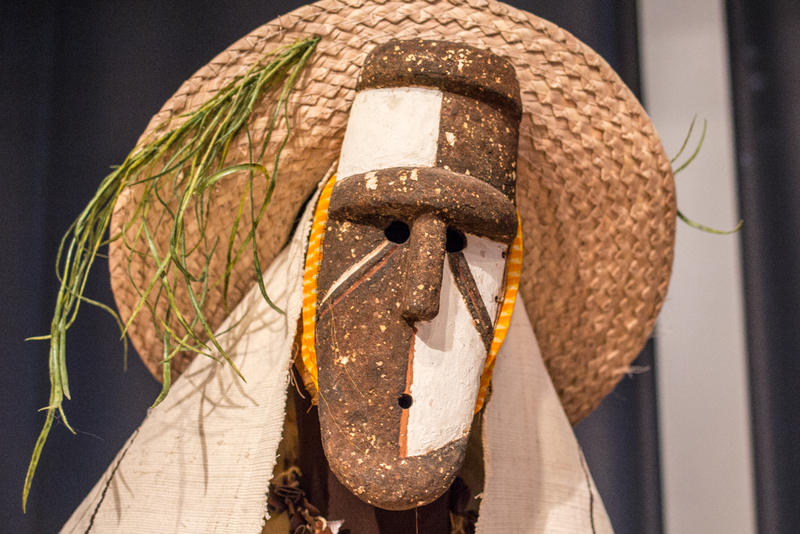 Nnada Okumkpa (Senior Leader’s Mask), Chukwu Okoro, Gift of Simon Ottenberg, in honor of the 75th Anniversary of the Seattle Art Museum, 2005.42, Photo: Natali Wiseman.